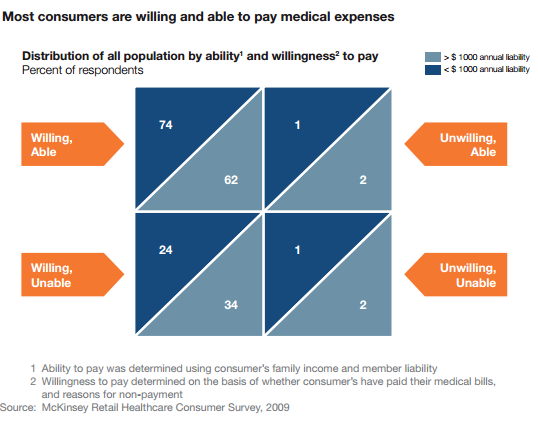 This McKinsey study did a fantastic job of explaining what we have seen in the patient account financing industry for the last five years. 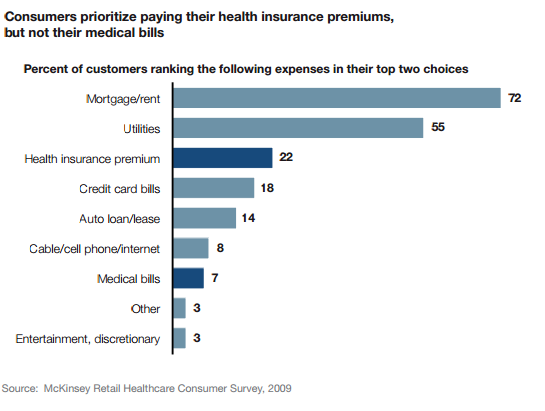 …so they move their medical bills down their priority list below everything else that fits into their monthly budget. 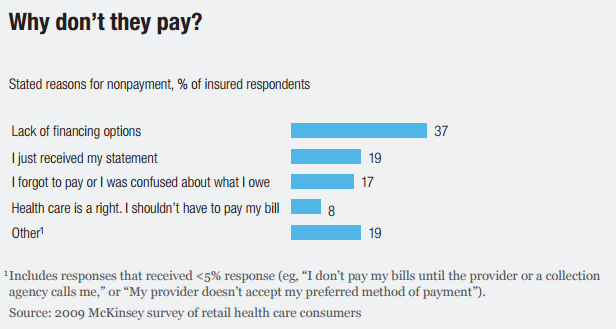 The McKinsey study summarizes this perfectly: our research suggests that the industry can address a significant portion of the bad debt in the system through approaches that not only make payments more convenient, less confusing, and easier to distribute over time through financing but also reposition medical bill payments in the household payment hierarchy. New payment solutions must tackle consumers’ confusion and concerns head on. Automated payments, patient statements (instead of bills and explanations of benefits), structured payments plans or patient loans, and even incentives and reward points based on principles from behavioral economics should all be considered in building a value proposition that consumers will readily adopt. Such innovative payments approaches could create nearly $60 billion a year in value as well as achieve substantial savings in the administrative costs associated with inefficient processing and collections. Since its inception in 2005, Epic River has been providing financial institutions with software and services for process and revenue improvement. MyLoans, our Patient Lending solution, partners financial institutions and healthcare providers to offer low interest loans to cover patient balances. Practices, surgery centers and hospitals get immediate funding of their patient’s outstanding balances and patients avoid financial harm.